January 18, 2014 was not an exceptional day in North Korea by anybody’s standards. It was not exceptional in military, economic, political, social or developmental terms, and its unexceptional nature was captured in the reporting of Rodong Sinmun and its accompanying English language website. There were stories about construction beginning on a shopping center complex in eastern Pyongyang, congratulations sent by Kim Jong-un to a citizen turning 100 years old, and a performance given by a politically inspired youth organization. Though such reports are not exceptional for North Korea, that is not to say they would necessarily be considered normal for other nations; notably, there were two reports on fungal matters that very day. While I am sure qualitative research could be done to ascertain the facts of the matter, for once I will concede to what might be termed common sense: it is not normal for a national newspaper to cover issues relating to mushrooms and their scientific development and production. As these narratives are connected to reportage on scientific research, much of the material for analysis involves scientific institutions and organisations in the developmental sector. In the case of fungal science, for example, a great deal was made of the rebuilding of the Central Mushroom Institute in Pyongyang. There are seemingly a plethora of such institutions, with North Korea apparently possessed of a scientific/research community akin to the corona of think-tanks, consultancies and research centers surrounding Western loci of government. The tendency of the external interested observer may be to regard these as no more than meta-devices, rolled out in reportage or presentational production to add academic or intellectual legitimacy and authority to a particular new scientific or developmental theme. In the case of the Central Mushroom Institute of Pyongyang, while its physical image is most undoubtably real, its origins as an institution are obscure and not subject to extensive coverage in North Korean texts. Thus, its original raison d’etre is difficult to analyse. This blank slate quality is a feature shared with a number of similar institutions, but not all. This essay will attempt to identify and frame the development, both narrative and otherwise, of such educational and research institutions using an institutional and sectoral example that is much better evidenced by textual sources. Kim Il-sung on Hydrology and Forestry | Kim Il-sung’s text “Let us Expedite the Introduction of a Supply of Running Water” from 1973 ostensibly focuses on a sector very much of interest to this author: hydrological engineering and water supply. However, the text opens up in scope to reveal a sectoral focus that is equally interesting and loosely connected, but on the surface very different. With the words “Next, I am going to speak about the task of afforestation…” Kim abruptly shifts the text towards forestry and timber management, an area extensively covered by Sino-NK analysts and contributors (for extra reading please see the note at the conclusion of this essay). At the consultative meeting of the chairmen of the provincial people’s committees on September 5, 1962, I spoke about the need to plant the roadsides with large numbers of trees which grow quickly and thrive and are capable of protecting the roads and also of being used as raw materials for paper. In my speech delivered to the officials of the Party and government bodies and social organizations in Ryanggang Province in May 1958, I told them to plant firs and white ashes widely in Ryanggang Province and undertake afforestation with definite aims under a ten-year plan. All this show that our officials still lack the Party spirit. Their Party spirit must find expression in practical deeds, not in lip service. In other words, it must be expressed in their fight to carry out Party policy…. The key questions obviously being: What are the routes to this expression? How might these deeds be accomplished through that expression? And how will this expression find translation in practical policy? 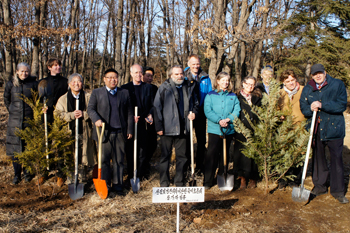 Kim’s first assertion is that if party organizations had “only developed a campaign for each person to plant ten trees every year, the timber situation in our country would not have become as acute as it is now.” Therefore, the policy goal is easily accessible; resolving the timber situation, to be achieved by involving the population in planting those ten trees. What is not accessible or obvious is the route to that goal, how those trees are to be sourced, planted or managed, or indeed which and what sort or species of trees shall be planted. [T]he officials of the Agricultural Department of the Party Central Committee have not given competent assistance to the workers of the Pyongyang Botanical Gardens who have been working very hard to develop afforestation…. Over the years, the workers of the botanical gardens have done a great deal of work to increase the forest resources of the country. I have already said more than once that the dawn redwood owes its present wide distribution in our country to the efforts of these workers…. Technical guidance for the cultivation of seedlings should be the responsibility of the higher agricultural schools and the Pyongyang Botanical Gardens…. The People’s Army must also grow seedlings. Some botanists will have to be sent to the People’s Army to give it technical guidance…. The People’s Army and the Ministry of Public Security must also start an extensive campaign to plant trees. The People’s Army must plant 15,000 hectares of forests every year…. [T]he botanical gardens are asking for work hands, lorries and tractors which are needed for the cultivation of seedlings. The Administration Council must comply with their request soon. In addition approximately 40 hectares of land in the vicinity of the botanical gardens will have to be transferred to them…. The Pyongyang Botanical Gardens must see that these seedlings are grown in North and South Hwanghae Provinces and Kaesong City and also widely in Wonsan…. Educational and technical institutions within those provincial spaces thus established further connectivity with the project agenda and approach, in particular Wonsan University of Agriculture, essentially re-embedding it with epistemic communities of researchers. 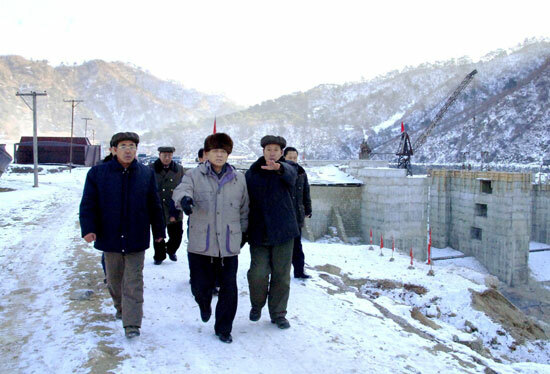 Ultimately this framework of policy development foundation, research praxis, output dissemination, logistical inculcation and finally provincial connection is one repeated in numerous North Korean developmental sectors. Many agricultural and developmental exemplars can be extracted from the literature, from sectors as diverse as tidal or coastal reclamation, stock breeding or pomiculture , all following the same strategies and connective routes. 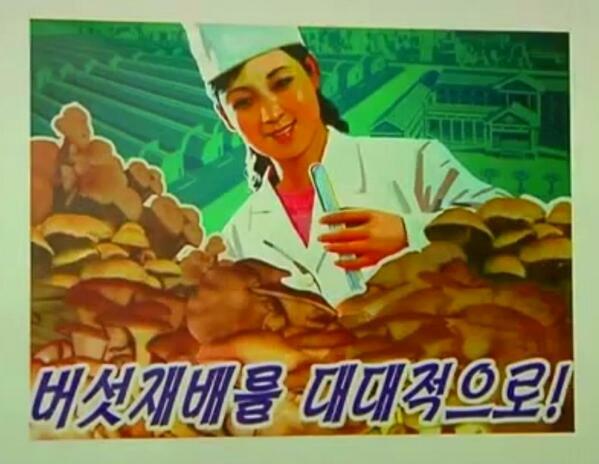 Although the foundational moment for mushroom development in North Korea is not evidenced by any available documentation, the emergence of the Central Mushroom Institute of Pyongyang can be seen within the same developmental institutional context. It is essentially the core of an epistemic community focused on fungus. This community is driven and directed by political and ideological direction from a central government institution or impetus, and utilized at key moments, such as during the “sunshine policy” policy period of momentary détente between the Koreas. No doubt in future years we will see its further embedding with provincial or other institutions, as the output of its internal, semi-visible political and epistemic communities becomes useful or utilizable within the wider context of charismatic Kimism and developmental possibility. Christopher Green, “Transnationalizing Northeast Asia, One Tree at a Time: Interview with Dr. Park DongKyun,” Sino-NK, September 24, 2013. Robert Winstanley-Chesters R, “Trees and a Trinity : Environmental Narratives Revised at the Accession of Kim Jong Il,” Sino-NK, March 27, 2012. Robert Winstanley-Chesters, “Forests as Spaces of Revolution and Resistance : Thoughts on Arboreal Comradeship on a Divided Peninsula,” Sino-NK, June 28, 2012. Robert Winstanley-Chesters, “Treasured Swords: Environment under the Byungjin Line,” Sino-NK, June 3, 2013. Robert Winstanley-Chesters, “Charismatic Environs: From Local Landscape to National Landschaft,” Sino-NK, September 5, 2013. Kim Il-sung, “Let us Expedite the Introduction of a Supply of Running Water,” Works 23, (Pyongyang, Foreign Languages Publishing House, 1973), 269.